This clean and colorful 2,750 s.f. open office was designed for a company with straightforward requirements: open space and storage. We developed a simple and elegant system of multi-colored sliding panels to contain the clutter. We provided complete FF&E services as well. In 2016, Gran Kriegel is launching a new project for Swaps Monitor, fitting out a 3,000 s.f. 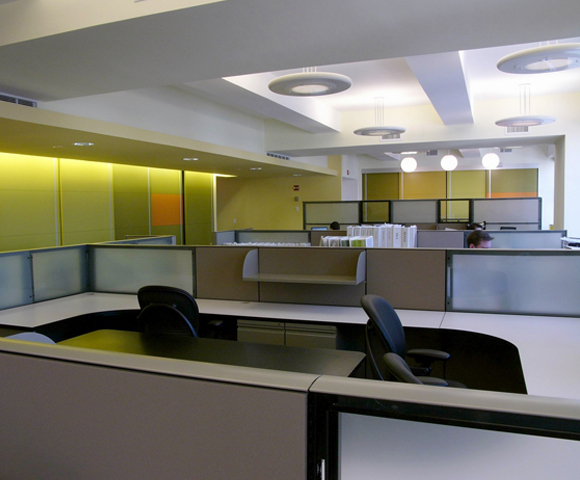 space consisting of open offices and conference room. We are responsible for architectural design as well as FF&E.